I’ve counted, and there are approximately two bajillion videos on YouTube. Searching for what you want is easy enough, but what if you want to just stay up-to-date on a couple of channels? The YouTube website provides a Twitter feed-style stream of updates to your subscriptions, but it could use some improvements. YouTube Video Deck makes it easier and faster to follow YouTube channels. First grab the YouTube Video Deck app from the Chrome Web Store. Getting started is fairly straightforward. You’ll need to log in to your Google account and grant YouTube Video Deck access. Logging in is simple; you can’t miss it. 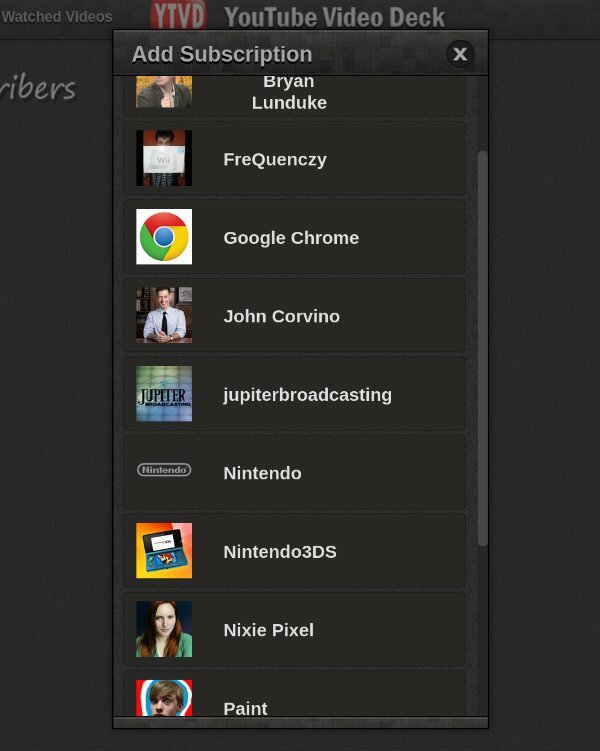 After you sign in to your YouTube account, you can immediately begin adding your subscriptions. Just head to the “Add Subscription” button in the top left. A window will pop up displaying all of your subscriptions. Here is a taste of what I like to watch. It should come as no surprise that I’m a bit of a tech geek. 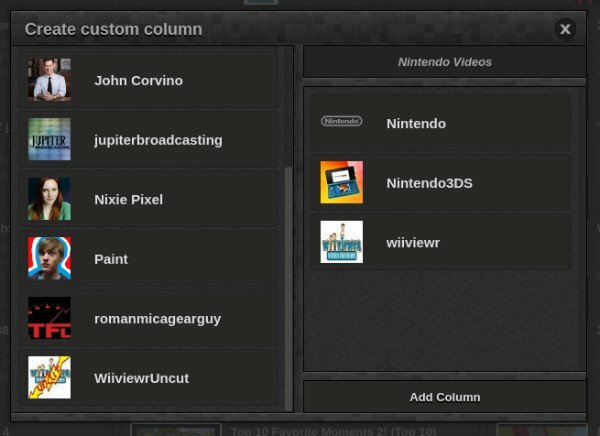 To follow YouTube channels, click on the subscriptions you want to have easy access to, and they will each appear inside YouTube Video Deck in a series of columns. Below I have dedicated one column to Jupiter Broadcasting programming, another to Wii reviews, and a third to car reviews. Each column displays the latest episodes, their length, brief descriptions, and their number of views. You can now sit back and enjoy your favorite content at your leisure. If you’re still not fine with the interface, there are a limited number of options available under the settings menu. 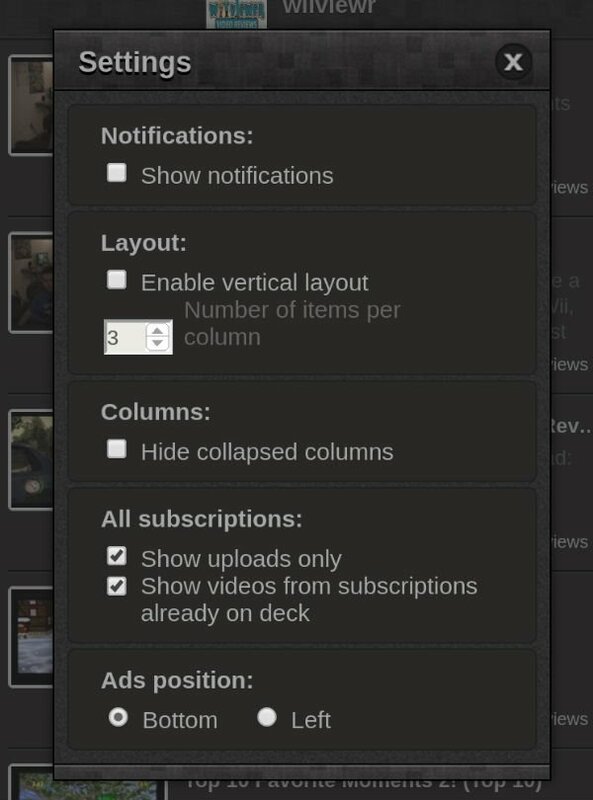 Columns can be arranged horizontally instead of vertically, and notifications can be enabled. 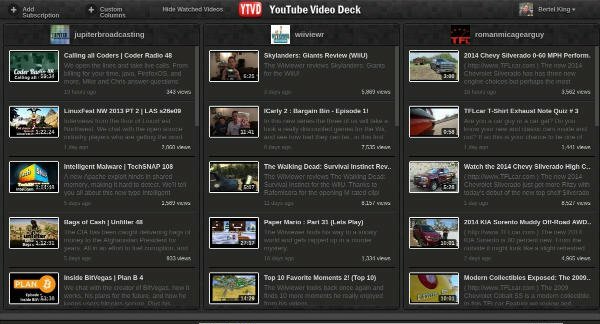 YouTube Video Deck makes managing your subscriptions easier, but it is not an all-in-one solution. When it comes time to watch a video, the app will bump you back out to the YouTube website. YouTube Video Deck is a great tool for managing YouTube within your browser, but don’t expect it to offer a dedicated media streaming experience. YouTube Video Deck is also an ad-supported program. If you want to have a clean interface, you’ll have to upgrade to the pro version, oherwise you are left with large banners strung across the bottom or the left side of the screen. Ads may not bother you, but they completely yank me out of what would otherwise be an immersive experience. If you’ve used TweetDeck before, YouTube Video Deck should look and feel familiar. The interface is largely the same, and so is the concept. YouTube Video Deck isn’t without its limitations, but if you follow YouTube channel, and by this I mean multiple channels, this app can make your life a tad easier. If you have tried other means of managing YouTube, let us hear about it below.